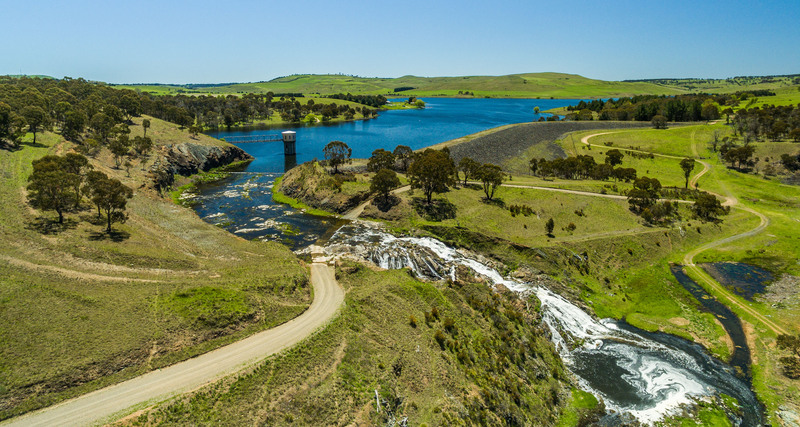 Guyra's water supply system extracts water from the Gara River system with two dams located on the river north of Guyra. The first dam was constructed in 1957, with a second dam added in 1967 to supplement the supply storage. Water is pumped to the Council’s water treatment plant and then the treated water is pumped to the two town reservoirs. The pump line to the treatment works had augmentation works completed in 1981 with the addition of the second larger town reservoir to meet the town requirements at that time. Council has made improvements to the water system in Guyra with the implementation of fluoridation of the Guyra water supply. The fluoridation dosing equipment was installed in 2008. Other improvements included the relocation of the activated carbon dosage plant to the water supply reservoirs to improve the quality of the taste and odour of the water. Malpas Dam is located to the south east of Guyra and to the north of Armidale. It was built in 1968 as the major water supply for the city of Armidale and currently has a storage capacity of 13,000 megalitres with expansion capabilities to 26,000megalitres. Armidale's water supply is ozonated to remove unpleasant tastes and odours that can be caused by blooms of algae in our water system. Ozone gas is generated on-site at the Water Treatment Plant in the Ozonation facility and is then added to the water to break down anything unpleasant. The water is then filtered to remove any remaining solids then fluoride is added for dental health and chlorine to ensure the water stays disinfected until it gets to your tap.